When I was in 10th standard I came across a documentary related to the IAS training academy at mussorrie. I was inspired by that documentary and later tried to explore more information about the services like IAS and IPS. I was very much influenced by the work done by some renowned IAS and IPS officer , that I decided to study for this exam i,e UPSC. I was in the United states for a masters in civil engineering program at the famous Purdue University in the state of Indiana. Being from a educational background (both parents are professors in pune), I had decided to first complete my education with a MS degree. Even when I was in USA, I always kept this at the back of my mind that I have to go back to India after the MS program gets completed and start my ups preparation. During my stay abroad I constantly read articles from THE HINDU AND INDIAN EXPRESS. I started my UPSC preparation in 2012. I selected Public administration and sociology as my optional subjects. Before 2013 prelims there were two optional subjects. But in 2013 attempt I dropped sociology and selected Public administration as my optional. This is the most crucial part of the process. Due to heavy competition prelim has become a cause of concern. I suggest you to complete as much as syllabus as possible for prelims. 6. Ramesh singh for economy. related to IR, international organizations, polity etc. Read these sources thoroughly and completely..
7. if possible punch commission report. I had revised these notes a number of times.. The challenge in PA is to comprehend the question that is asked in the paper… the questions are not at all straight forward. This skill comes by extensive reading, notes making and answer writing. This website is an ocean of knowledge and information. Personally it has benefited me immensely. As GS 2 and 3 are mostly current affairs , we need to have a good hold of the basics first. 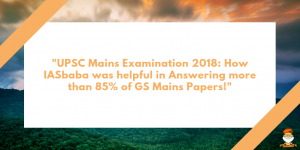 Then IASbaba can be of greatest use for supporting that theoretical part with numbers , graphs, schemes, most important thing in GS papers in the variety of angle and inter-linking that you make in your answers. I strongly believe that this website can be very helpful to those who do not have the resources to join classes in Delhi. This can be a treat for rural aspirants also. Most crucial thing in upsc prep is time management. I was very strict about time management. Every day i used to set a target for completion on some part of syllabus… and i used to try to complete my syllabus 2-4 days before the exams start… may it be prelims or mains… It is most crucial to stay relaxed before the exams…. revision of IAS baba notes and material used to be done on a regular basis..
1. What do you understand by competitive federalism? Is it different from cooperative federalism? Substantiate by giving examples.